Titleist er kjent for å produsere kvalitetskøller. Nå kommer de nye wedgene. Golfsiden har testet ut Vokey-wedgene fra Titleist i mange år. Det har vært et godt bekjentskap. Forhåpentligvis kan Golfsiden komme med testresultater i løpet av våren. FAIRHAVEN, Mass. (Jan. 26, 2016) – New Titleist Vokey Design Spin Milled 6 wedges – the next step in wedge innovation from the clear leader in the category – establish a new performance standard by improving in the three key areas of wedge play: distance gapping, shot versatility and spin control. • A groundbreaking new Progressive Center of Gravity (CG) design aligns the CG with the impact position of each loft to produce precise distance and trajectory control with exceptional feel. Engineered using cutting-edge CAD technology, the Progressive CG is visible technology on the back of the wedge. 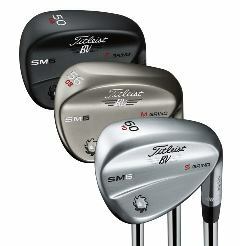  Low Loft (46º-52º) SM6 models feature a low CG that increases ball speed on average by 1.5mph (3-5 yards). This low CG position provides a precisely aligned progression from a typical iron set. It is visible technology, highlighted by a thinner topline and raised lower section.  Mid lofts (54º & 56º) feature a mid CG position, precisely aligned between the low lofts and high lofts, that provides precise distance gapping and exceptional feel.  High lofts (58º-62º) feature a high CG position that produces tighter distance dispersion, improved trajectory control and better feel. The high CG position is precisely aligned with the impact position of high lofted wedges, higher on the face. It is visible technology, highlighted by a raised upper section. • Master Craftsman Bob Vokey’s five tour-validated SM6 sole grinds have been fine tuned through Bob’s work with the world’s best shot makers, providing golfers of all skill levels with improved shot versatility for their swing type, shot making style and course conditions.  All five SM6 grinds (L, M, S, F, K) are currently in play across the worldwide professional tours. Each grind is a direct result of Bob’s experience fitting tour players, PGA professionals and amateurs of all skill levels for more than 20 years. • New 100% inspected proprietary Spin Milled TX4 grooves and face texture deliver more spin (up to 200rpm more spin on average) with more consistent spin control.  New TX4 grooves are engineered with a machine milled, parallel face texture that creates a sharper, more consistent groove edge.  TX4 grooves feature two groove geometries: a narrower, deeper groove for the 46º-54º lofts; and a wider, shallower groove in the 56º-62º lofts.  The parallel face texture and progressive groove geometries optimize ball-to-groove edge contact, producing more spin and control around the greens. Available in golf shops beginning March 11, Vokey SM6 wedges are available in 46º to 62º lofts and three finishes: Tour Chrome, Steel Gray and Jet Black (raw). Sony Open in Hawaii reaching 110. Jordan Spieth started 2016 with four SM6 wedges in his bag, winning the Hyundai Tournament of Champions by eight shots with a 30-under total. Spieth first put the SM6’s in play in November at the WGC-HSBC Champions event. In addition to Spieth, SM6 models are in the bags of more than 45 players on the PGA Tour, including Jimmy Walker, Jason Dufner, Robert Streb, Adam Scott, Bill Haas and Webb Simpson. See attached file for reaction from PGA Tour players already playing SM6 wedges. ADVANCED PERSONALIZATION AND CUSTOM OPTIONS: SM6 wedges can be custom ordered with a wide range of specifications and personalization, including an industry-leading selection of shafts, grips, shaft bands, ferrules, stamping and paint fill. For a complete list of personalization and custom options, visit Vokey.com. PRICE AND AVAILABILITY: Vokey Design SM6 wedges are available in golf shops beginning March 11 at 1495 NOK. “The new SM6 wedges allow me to get more spin and control than ever before – and spin is huge out here on the PGA Tour. We are getting firmer and faster conditions especially in the bigger events. You need to have spin. Bob and his team have done a great job to find a way to pick up the 200 or 300 RPMs, which could be the difference in your ball being inside the 5 feet, or maybe catching a ridge and rolling back 10 feet. That’s the type of dedication that we need out here because all of those little things make a big difference.